Following on from this week’s post about our fearless geoarch, we thought we would focus this Valentines Day on our love of the site, The Walbrook. The geoarchs’ main aim throughout our excavations was to map the watercourse through the area, and answer questions such as how quickly did it flow and what was the immediate environment like? Oh and that all important question, could you get a boat up the stream? The Walbrook is now a subterranean river that runs through the city from the Shoreditch area to Cannon Street where it meets the Thames. It is fed by a number of small tributaries, although its source is of some debate. It is thought the brook was named such because it ran under the city wall. 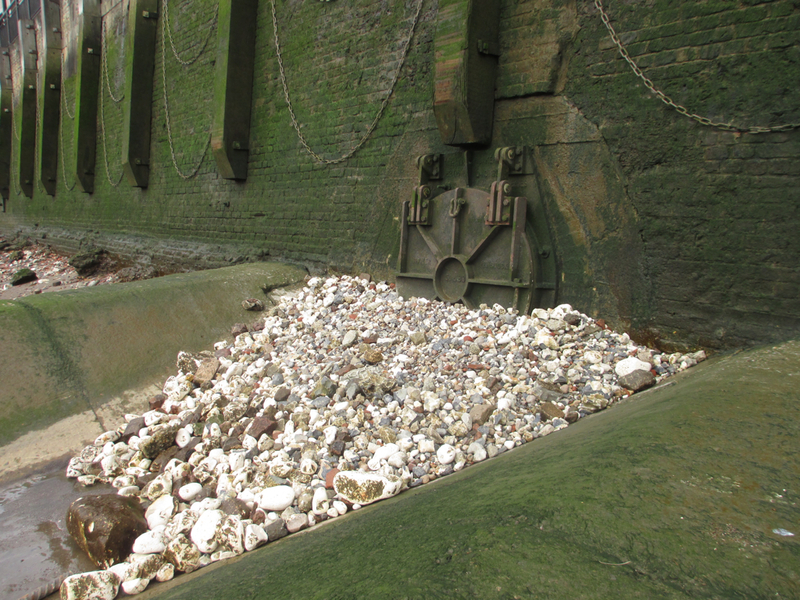 During the Roman period, the Walbrook is thought to be both a source of clean water and a sewage system to take the rubbish from the city to the Thames, and possibly deep enough to sail boats upon. 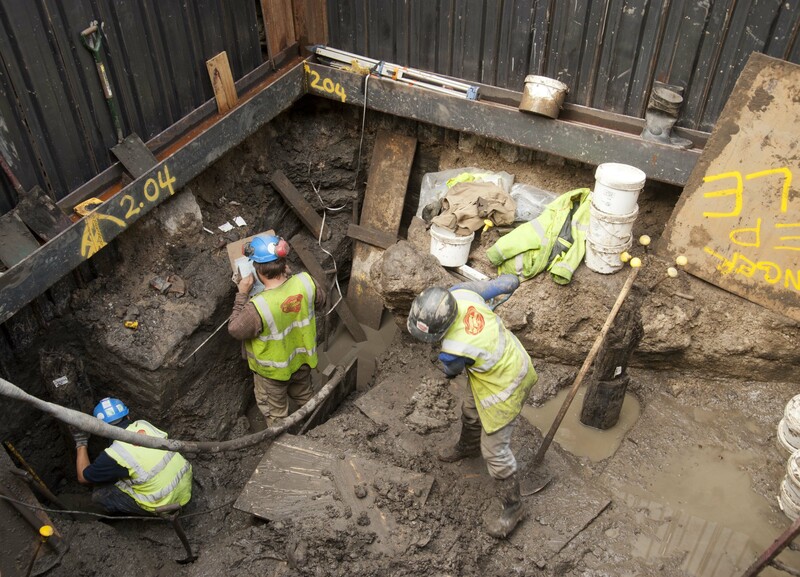 We know from our excavation, and others in the city, that from the earliest Roman period the banks of the Walbrook were built up and occupied. It was an important source of water for individuals and industry, and of course the Temple. The Walbrook is also famous for the number of human skulls found within the deposits. It was once believed that the large number of skulls in the Walbrook bed had originated from a Roman legion, all of whom were decapitated by Boudica. In recent excavations further skulls have been found, and reinforces the more likely taphonomic hypothesis that they had been washed down stream from the cemetery to the north of the city during the Roman period. After the Roman period it is thought the city was abandoned until the Medieval period. The Walbrook was mentioned in the 15th century when the Lord Mayor ordered the lower Walbrook stream to be covered over, presumably because it was so full of rubbish and smelt foul! In the Agas map of 1562 the whole of the Walbrook within the city walls was culverted, and was completely hidden. In the 19th century much of the Walbrook was channeled into a Victorian brick sewer system under the city. The Walbrook is the subject of much debate, and people dedicate their time to studying the hydrology of the river. It’s probably easy to develop a love for the river from behind a desk, but what about the people on sites across the city collecting the data? Well our relationship is tempestuous to say the least. 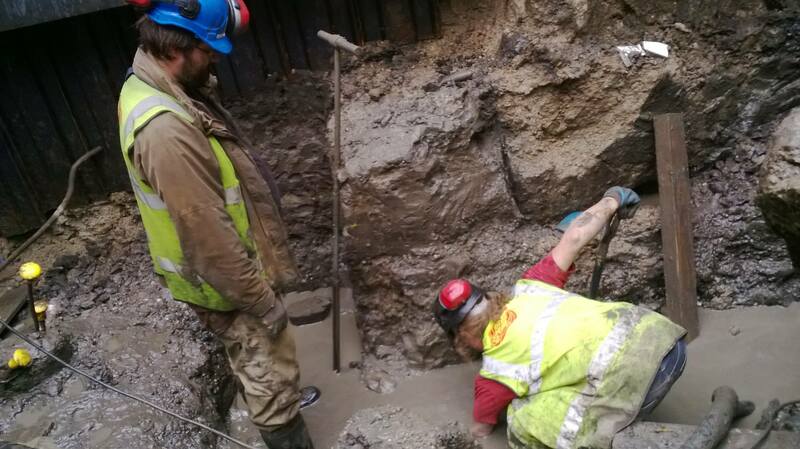 As mentioned in the previous post the geoarchs often spend their time in deep, muddy, wet holes, as the Walbrook forms the deepest deposits on the site. Once down into the gravels of the river bed the full force of the river can be appreciated – if you’re lucky you are taking in its splendour from the top of the trench; if you’re unlucky you are standing in it. The water that now flows underground, well the bit that is not channeled into the Victorian sewer system, takes every opportunity to fill every hole and void you open up. Excavating and recording these lower deposits can be a logistical challenge; merely pumping the water out does not work as it is quite silty. We often had to construct elaborate, and some not so elaborate, silt trapping devices. And sometimes we just gave up all together and dug the deposits from under a foot of water. Excavation by feel is something we have all picked up on this site! Attempts at reducing the water levels…. The channel of the Walbrook appeared in profile much like the cut of a ditch, and was filled with a combination of sands, silts and gravels. It wove its way across site, cutting through the natural London clay, flooding on occasion and generally making the area very marshy and wet. We used different techniques to record this; on site we carried out a number of auger hole surveys, using transects to compare heights of deposits from holes across the site. 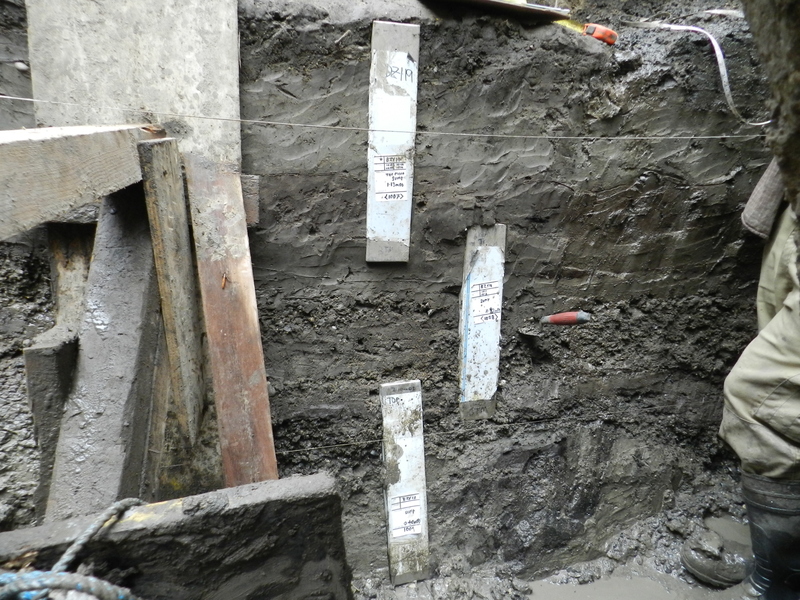 We also excavated parts of the Walbrook, leaving vertical standing sections for the geoarchs to draw and sample. The sections and bore holes will be located on a digital map of the site using GIS (Geographic Information System) so the vertical heights of the deposits and the channels can be plotted accurately. This in turn will give us an idea of what the valley around the Walbrook would have looked like before and during the Roman period. The Walbrook is not only beloved of the geoarchs, but also the archaeologists and find specialists too. The slightly annoying and inconvenient water levels do mean that organic and metal finds are amazingly preserved, as we have mentioned before. On other sites, copper coins are usually corroded lumps of green; however on our site they are golden coloured perfect examples. And our timbers are not just dark stains in the ground as you usually find, but lovely solid pieces of oak. 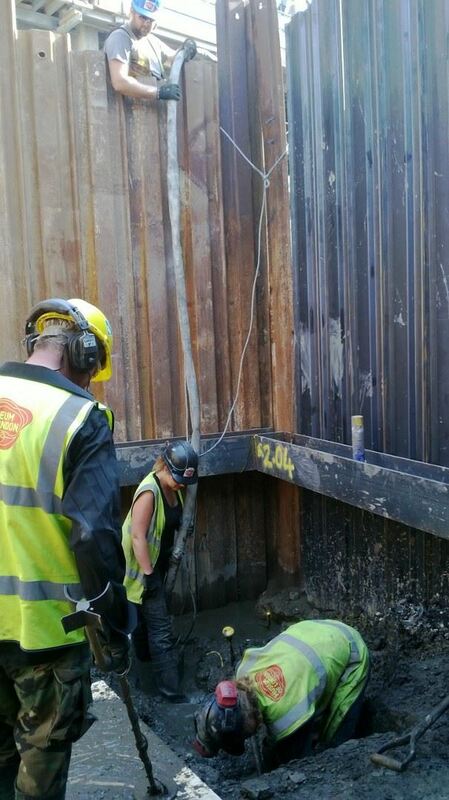 So on site we love the Walbrook, but we also loath it at the same time. It provides us with so many happy positive memories of the site, but also so many terrible wet muddy ones. Thank you for another fascinating post. I’m interested in the lost rivers of London, including Walbrook. I do enjoy reading your blog!